What does this giving statement include? This giving statement includes all tax-deductible donations from January 1, 2018, through December 31, 2018, whether made online, given at Sunday gatherings via check or cash (when accompanied by a donation envelope), or sent by mail. If I don’t have an account on RLA Connect, how can I receive my 2018 giving statement? Create an account on RLA Connect here. After you request a login, our team will connect your form to any info we have on hand and send you an email for activation. What if I’m married and wish to export my combined statement? You will be able to create a combined family statement by selecting Family instead of Individual between steps 3 and 4 above. If you do not see the Family option, reach out to our support team (help@realityla.com) with your full name and spouse’s full name to get your RLA Connect profiles connected. 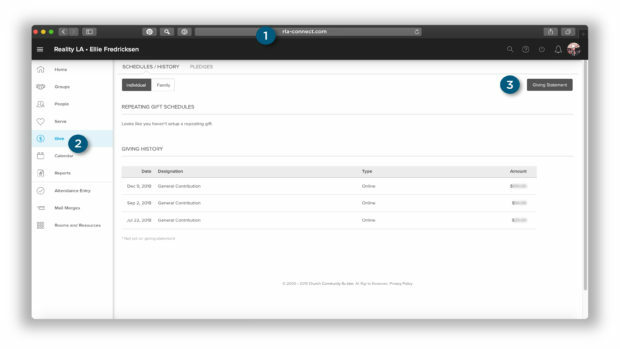 Once your profiles are connected, you will be able to export a combined family statement. What if my mailing address is incorrect on the statement? Once logged into RLA Connect, click on your profile circle in the top right corner of the webpage. On the profile page, click the Edit Profile button and change your mailing address. 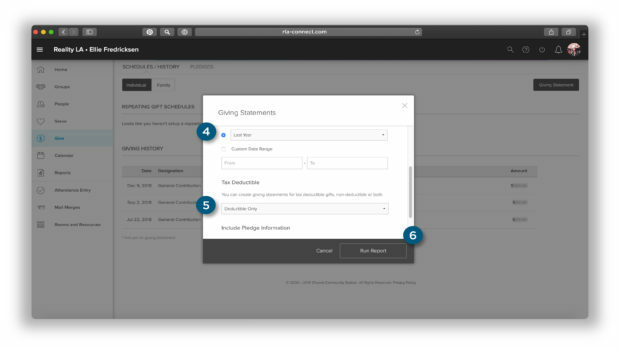 Then regenerate your giving statement by following the steps above. What if my donations are incorrect? If it appears that your donations are incorrect, please email give@realityla.com or call 323-883-1812, extension 109.